To be present with the Lord is the earnest longing of every true believer. When and how will this be brought about? The Lord's answer to this question is most illuminating. In my Father's house are many mansions: if it were not so, I would have told you. I go to prepare a place for you. And if I go and prepare a place for you, I WILL COME AGAIN AND RECEIVE YOU UNTO MYSELF; THAT WHERE I AM, THERE YE MAY BE ALSO (John 14:2,3). For this we say unto you by the word of the Lord that we that are alive, that are left unto the coming of the Lord, shall in no wise precede them that are fallen asleep. For the Lord himself shall descend from heaven, with a shout, with the voice of the archangel, and with the trump of God: and the dead in Christ shall rise first; then we that are alive that are left, shall together with them be caught up in the clouds, to meet the Lord in the air: and SO shall we ever BE WITH THE LORD. Wherefore COMFORT one another WITH THESE WORDS (l Thes. 4:15-11 R.V.). Believers get to be with the Lord by His coming for them, not by some other means or at some other time. What then about the statement in 2 Corinthians 5 :8, "absent from the body and to be present with the Lord"? Does this not teach that believers go to be with the Lord when they die? Only by taking this passage out of its context and reading into it things it does not state can it be made to teach that believers go to be with the Lord at the time of death. 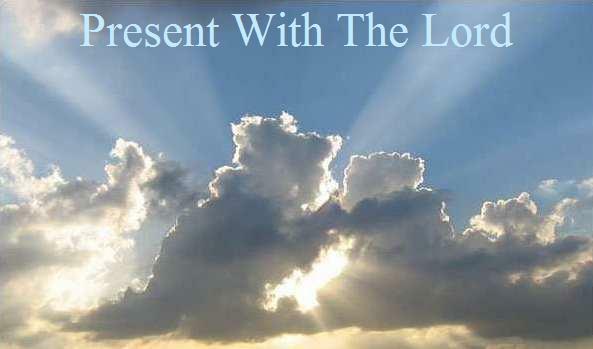 The passage does not read, "absent from the body is to be present with the Lord." Neither does it read, "absent from the body, present with the Lord." It reads, "absent from the body and to be present with the Lord." It states nothing about when or how believers get to be with the Lord. Believers have a living hope but that hope is not death. It is the return of Jesus Christ from Heaven. The context of this passage is plainly dealing with things that will happen when He returns. For we know that if (not when) our earthly house of this tabernacle were dissolved, we have a building of God, an house not made with hands, eternal in the heavens (2 Cor. 5:1). Two houses, the earthly and the heavenly, are introduced in this verse and are in contrast throughout the passage. The dissolving of the earthly house refers to the work of death. However, it should not be hastily concluded that the house not made with hands, is received at the time of death. There are also celestial bodies, and bodies terrestrial: but the glory of the celestial is one, and the glory of the terrestrial is another. There is one glory of the sun, and another glory of the moon, and another glory of the stars; for one star differeth from another star in glory. So also is the resurrection of the dead. It is sown a soulish body........It is raised a spiritual body. If there is a soulish body, .......there is also a spiritual body . . . . Behold, I tell you a secret: we shall not all sleep, but we shall ALL BE CHANGED, IN, MOMENT, in the twinkling of an eye, AT THE LAST TRUMP: for the trumpet shall sound, and the dead shall be raised incorruptible, and we shall be changed. For this corruptible must put an incorruption, and this mortal must put on immortality. But WHEN this corruptible shall have put on incorruption, and this mortal shall have put on immortality, THEN shall come to pass the saying that is written, Death is swallowed up in victory. 0 death, where is thy victory? 0 death, where is thy sting? (1 Cor.15:40-44, 51-55 R.V. See entire Chapter). The heavenly house cannot be received at the time of death because all are to be changed in a moment, AT THE LAST TRUMP, when Jesus Christ returns. Furthermore, the house not made with hands is said to he "eternal in the heavens" (2 Cor. 5 :1). It is not a temporary inswathment for the duration of the death state. If this eternal house is received at the time of death and another is received when the Lord comes, believers would have two. Surely one will be sufficient. For in this we groan, earnestly desiring to be clothed upon with our house which is from heaven (2 Cor. 5:2). Is it for death that believers groan? Until the Lord returns death is a victorious enemy with a sting. Believers groan for the return of the Lord and deliverance from death. "For we know that the whole creation groaneth and travaileth in pain together until now. And not only they, but ourselves also, who have the first fruit of the Spirit, even we ourselves groan within ourselves, waiting for the adoption, even the redemption of our body" (Rom. 8 :22, 23). If so be that being clothed we shall not be found naked. For we that are in this tabernacle do groan, being burdened: not for that we would be unclothed, but clothed upon, that mortality might be swallowed up of life (2 Cor. 5:3, 4). The "naked" or "unclothed" condition refers to the state of the dead, a state unwanted by living believers. Because the "we" and the "clothing" are distinguished, some hold that only the body dies while the real person lives on. This raises the question, what part of man is the real person? Many reply without hesitation, the spirit or soul, making little or no distinction between the spirit and the soul. The Scriptures most clearly distinguish between the spirit and the soul and teach that the person is made up of body, spirit, and soul (1 Thes. 5 :23; Gen. 2 :7). Death affects the entire person. Its effect on the body is apparent to all. Unfortunately many overlook the teaching of the scriptures concerning its effect upon the soul and spirit. The Scriptures most definitely teach that at death the soul dies. For example, "The soul that sinneth, it shall die" (Ezk. 18:4, 20); "He spared not their soul from death" (Psa. 78:50); "He hath poured out His soul unto death" (Isa. 53:12). Strange as it may seem the Scriptures never speak of the "immortality of the soul." The Greek word athanasia, which means immortality occurs only three times in the word of God: twice in 1 Cor. 15:53, 54; and once in 1 Tim. 6:16. At death the spirit (not the soul) returns to God. (Eccl. 12:7; Luke 23:46). However the spirit is not the consciousness, the ego. The spirit is associated with the breath, and is that force from God which produces life (Gen. 7:22 R.V. Gen. 2:7; Job 27:3; John 6:63). The union of the breath of the spirit of life with the body produces the consciousness. When this union is dissolved by death the consciousness ceases to exist until resurrection (Psa. 146:1-4; Eccl.9:5; Rev.20:5). The further fact that the dead are said to be asleep proves that consciousness is gone. Conversely resurrection is referred to as an awakening of the dead. The "swallowing up of mortality by life" will occur when the Lord returns. Then the mortal will put on immortality. A mortal person is one in whom the process of death is working. This is true of every living person from the time of birth. The dead are neither mortal nor immortal, they are dead. When Christ returns death will be swallowed up in victory. Immortality is that victory. To be made immortal is to be freed completely from death; not only from the death state, but also from the death process. Now he that hath wrought us for the selfsame thing is God, who also hath given unto us the earnest of the Spirit (2 Cor. 5:5). The Holy Spirit indwelling each true believer is the earnest of that fulness of life Jesus Christ will impart to them when He returns. Therefore we are always confident, knowing that, while we are at home in the body, we are absent from the Lord: For we walk by faith, not by sight (2 Cor.5:6, 7). While at home in the earthly body believers are absent from the Lord. It is a striking fact that the Scriptures represent the person as being where the body is during the death state. Pointed examples are as follows: "The hour is coming, in which all who are in the graves shall hear his voice, and shall come forth" (John 5:28, 29; "Them that sleep in the dust of the earth" (Dan. 12:2). Believers receive their heavenly bodies BEFORE they get to be with the Lord; the dead by means of resurrection and the living by transfiguration (Phil. 3:20, 21; 1 Cor. 15:51-53 cf. 1 Thes. 4:13-18). We are confident, I say, and willing rather to be absent from the body, and to be present with the Lord (2 Cor. 5:8). To make this refer to death is to make the Apostle contradict himself within just a few sentences. In verse four he writes, "not for that we would be unclothed" while in verse eight he is "willing rather to be absent from the body." The Scriptures make it plain that "absent from the body and to be present with the Lord" is a direct reference to what will take place when the Lord returns. Wherefore we labor, that whether present or absent, we may be well-pleasing to him. For we must all appear before the judgment seat of Christ; that everyone may receive the things done in his body, according to that he hath done, whether it be good or bad (2 Cor. 5:9,10). The earnest endeavor of every spiritual believer is to be well-pleasing to the Lord in everything. This is true not only because of all that He means to them as their Saviour, but also because of the day of reckoning which is coming when each will be requited for the things done in the body whether good or bad. Copyright � Saviour of All Fellowship P.O. Box 314, Almont, MI 48003, U.S.A. 810-798-3563 This publication may be reproduced for personal use (all other rights reserved by copyright holder).